Earlier this month, a report put out by The Center for Popular Democracy and the Integrity in Education project found that since charter schools first appeared in the early 1990s, they have been responsible for costing taxpayers $100 million in fraud, abuse, and waste. – Fredrick Douglass, quoted at the Whose Diversity? rally on the steps of Morrill Hall, Thursday, May 15. This week, we’re highlighting the recent and exciting organizing work of Whose Diversity?, a collective of undergraduate and graduate students at the University of Minnesota. The group sees itself extending the struggles to challenge and transform the culture of exclusion and enclosure of Black, queer, Chicano, Indigenous, working class, and other minoritized spaces, knowledges, and people at the historically white institution. Even after threats by the University administration to sanction and even expel some of the organizers, the campaign continues to gain momentum. Whose Diversity? say they’re taking their cues from such critical movements as the 1969 Morrill Hall takeover that led to the creation of African American and Chicano Studies and the 2005 General College Truth Movement, which sought to save the singular space that provided support for working class folks, older people, single mothers, and people of color to learn and get degrees at the U of M. More recently, Whose Diversity? has been influenced and continues the work of Whose University? 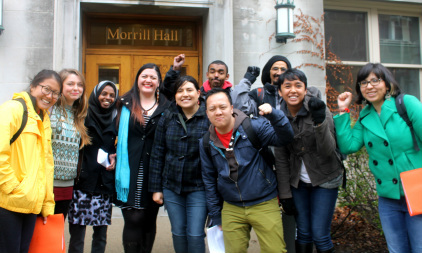 during the 2010/2011 school year, which occupied Coffman Memorial Union with more than 700 college and high school students to engage in critical dialogue around issues of access and representation at the institution. At Classroom Struggle, we think it’s important to highlight this work, and situate it within a broader landscape of student organizing for substantive diversity in Twin Cities schools and universities. Struggles like the 2013 South High School walkout protesting attacks on the All Nations program and the more recent student organizing at Central High School in St. Paul protesting the criminalization of Black and Brown youth in schools, among others, illustrate how critical and necessary this work and the leadership of students is, at all levels of education. Read below to find out more about the Whose Diversity? campaign. Like their Facebook page to receive regular updates about their work and list of demands. Classroom Struggleeducation organizinghigher educationPublic EducationSocial JusticeTwin CitiesWhose Diversity? Social Justice in Education Awards – Nominations due by May 26th! To nominate a student, youth worker, parent or caregiver, teacher, education support staff, administrator, or a community member for a Social Justice in Education Award, please visit here. 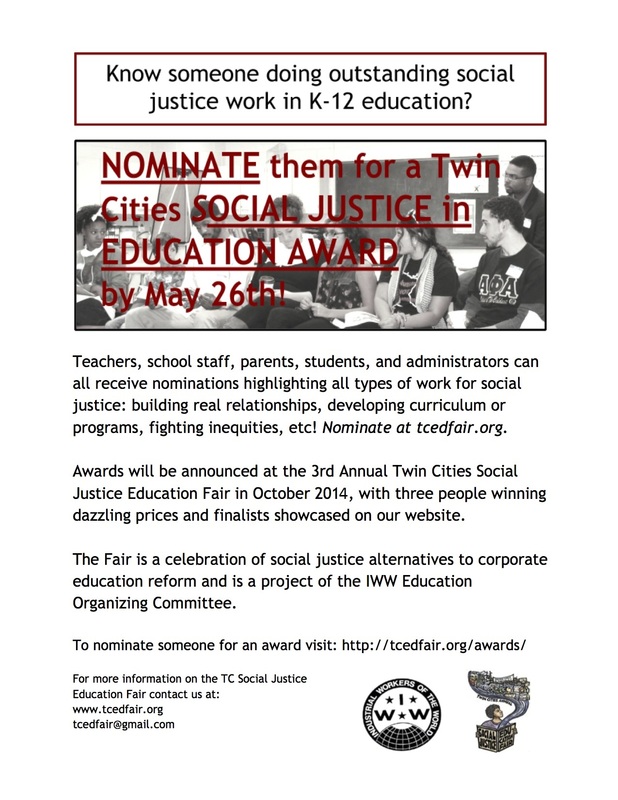 Finalists will be showcased here on Classroom Struggle, and winners of the award will win prizes and will be honored at the 2014 Twin Cities Social Justice Education Fair. Nominations are due May 26th! Nominate folks who are doing outstanding social justice work for K12 education by May 26th! Here at Classroom Struggle, we take a critical view of the charter school approach to improving the quality of K-12 education. While the larger arguments about what kind of education system we want and why our current one is flawed are important, it’s crucial first to have a grasp of the numbers. We’re reposting two recent stories below because of their timeliness and relevance as the end-of-the-school year standardized tests descend on classrooms everywhere.